We had our first bout of winter weather this weekend, with a few inches of snow followed by sleet followed by freezing rain. In other words, a slippery mess! 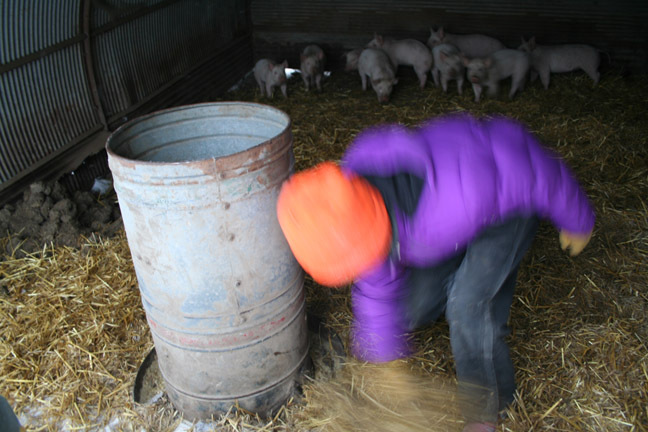 I followed Matt & Madeline around on Saturday while they did some of the pig chores. Because I’m helpful like that. then pours fresh water in. 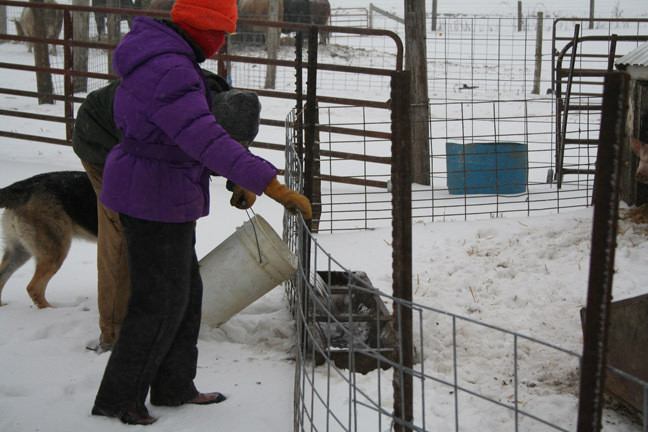 Generally Madeline fills a bunch of 5-gallon pails at the hydrant up by the house, then hauls them out to the livestock in the bucket of the tractor. and checks this litter’s feeder to be sure it’s full enough and is working properly. Ava would really like to be in there with her. Ava lives to herd pigs. Except that she doesn’t know how to herd, so it’s more like chasing in a most unhelpful manner. and give it a spin to bring fresh feed down. Matt’s to the left of the frame hand watering them. The sows get fed and hand watered. Then I was cold and went back in the house. 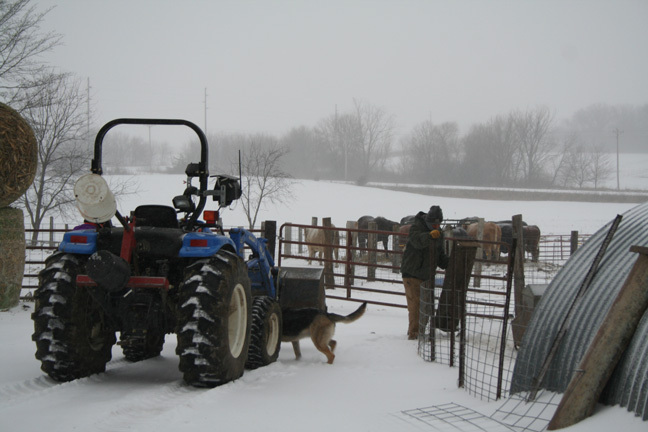 Matt & Madeline still had to feed and hand water Oliver, and check the feeder and waterer for the butchers. They’re the only group with a heated waterer. Soon the butchers will all be sold, then the 2 young litters can move into their pen. Ollie will go back in with the sows. 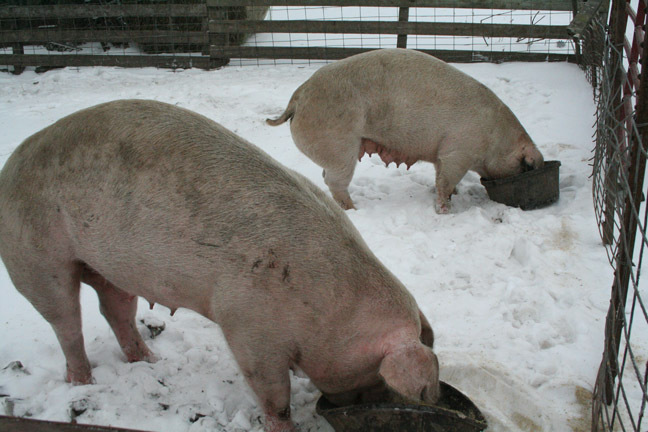 That will ease the burden of pig chores – just the breeding stock to hand feed and water, and the feeder pigs to check on – until farrowing time comes around again in March. K&B – The cattle and butcher hogs get water with a short hose from the hydrant into their tanks. Cattle need a refill twice a day, not sure about the hogs (since I’m not the one doing it.) The hose gets unhooked and drained after each use.The other groups of pigs (currently 4 pens) get hand watered. 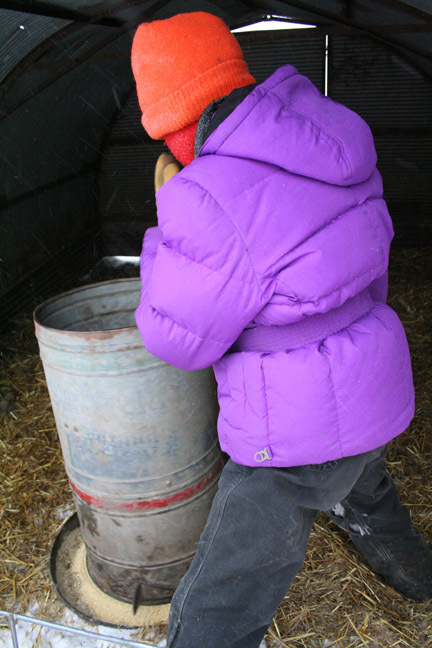 Madeline fills up a bunch of 5-gallon pails at the hydrant, then hauls them to the pens in the loader bucket of the tractor. Lots of spillage 🙁 Automatic waters are high on our list of projects, when we have the funds!